The Cotta' vineyard is located between Neive and Barbaresco, grown on calcareous soil typical of the great crus of Neive. 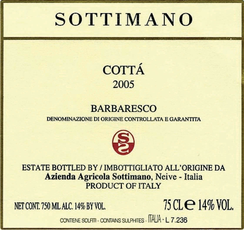 Cotta was planted in 1955 and the vines are 45 to 55 years old so the resulting wine is full-bodied and rich in polyphenols. Fermentation takes place in oak, of which about 30% is new, followed by 18-20 months in neutral barriques prior to bottling. At the beginning there were just few hectares , that only after many efforts (and some luck too) became the actual 18 hectares in ones of the greatest vineyards in Barbaresco. My wife Anna was always on my side, nothing would have been possible without her.In the cellar our vinification follows the same philosophy: natural yeasts, long macerations and a one-year-long permanence “sur lie” for the malolactical fermentation, as it was the rule decades ago.